Holidays in Gouves take you to the north coast of Crete. The town brings you a laid back, sophisticate atmosphere so you can spend your days relaxing, as well as enjoying close proximity to larger towns and the island’s major attractions. It’s surrounded by Blue Flag beaches, making it ideal for families, with beautiful views, colourful historic buildings, and a pretty port for couples. Beach lovers will find plenty of opportunities to relax and unwind, with large stretches of golden sands just waiting to be enjoyed. There are watersports, beach bars, and tavernas and plenty of facilities for those wanting to enjoy a bustling stretch of sand, as well as quieter beaches where you can find your own secluded spot. Those wanting to try scuba diving or snorkelling can explore underwater with boat trips leaving daily. Alternatively, stick to dry land and explore the whitewashed buildings and quaint churches of the old town. Holidays in Gouves bring you wonderful views of the sparkling Mediterranean Sea from its position nestled on the side of a mountain. Its old town in the hills is perfect for those wanting to experience the history of Greece, while the seaside area of the town offers a collection of bars, restaurants, and shops. The island’s capital, Heraklion, is just a 15-minute drive away and offers Venetian architecture, museums, and designer boutiques. Book your luxury holiday in Gouves and we’ll find the ideal hotel for your time away. Each of the hotels we offer has been specially selected and tried and tested by our expert staff to ensure you can just focus on relaxing. 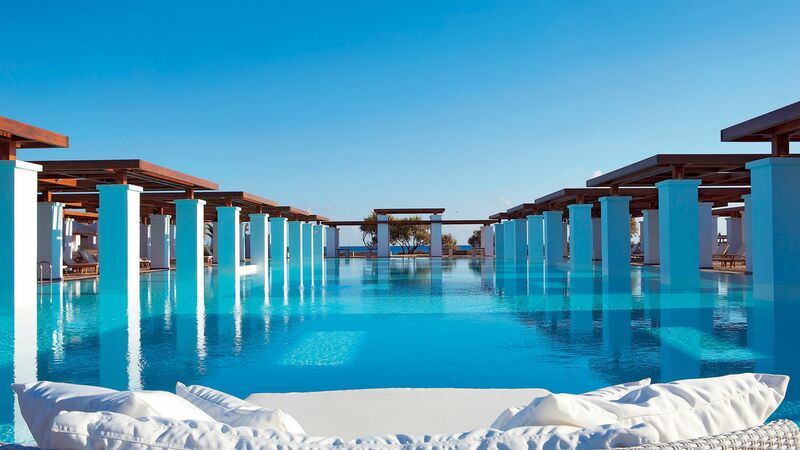 Choose the Grecotel Amirandes where modern architecture is inspired by the luxuries of ancient Greece and perfectly complements views of the sparkling ocean. Try all eight bars and restaurants, relax on the sandy beach, in the spa, or by the elegant infinity pool. There’s plenty for little ones as well, with full days of activities hosted by the Kids’ Club. I'd really recommend hiring a car, even just for a day or two. Crete has such a beautiful coastline, and the roads are easy to navigate. Transfer time from Heraklion airport to Gouves is approximately 20 minutes.